We are eating our own dog food everyday, using WeBuzz.IM in our daily network life. And we find some bugs, we love some features and want to add some more . 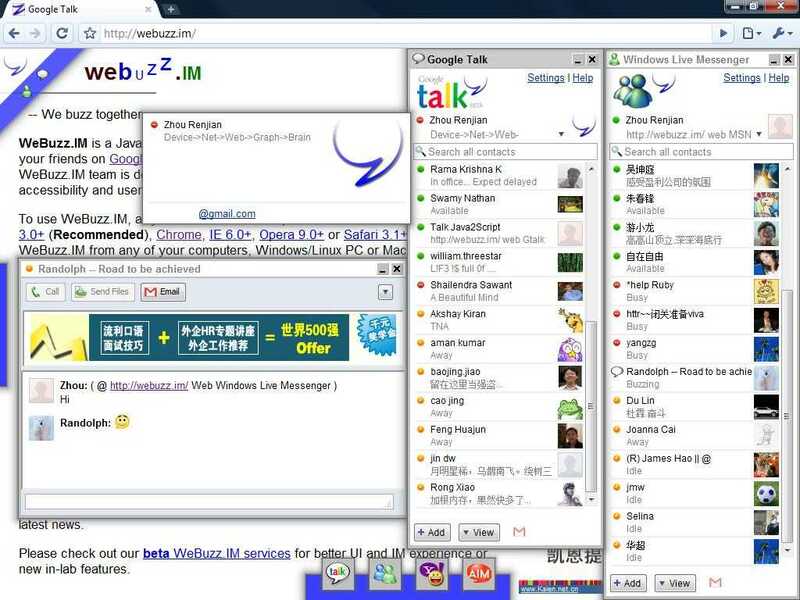 Avatar (or profile picture) is the main feature of Windows Live Messenger (MSN). As it is known, in Microsoft’s official messenger, we have to click on everyone’s icon to view the latest picture. It’s very inconvenient for us to catch up with friends’ updates. While, WeBuzz.IM shows all pictures by default. In this case, we won’t miss any new avatars. And we like to see those familiar avatars and would enjoy new avatars coming up now and then. Everyone likes the notification way. Most time, we do not like to be disturbed. While on internet ,we always notify some blinking titles starting with “[“, “<“, “(“, or anything else. Such useless message is not welcome , especially in working time. Don’t be worry. WeBuzz.IM can provide you a “safety situation”—no disturbution. For bugs, clicking on the scrollbars won’t activated the messenger client, a little confusion. IE 8.0 is not well supported yet. If there more than 2 messengers are open, it seems that no enough space is left for chatting … All these bugs may be fixed or may be improved in the future. Any others bugs? Which features do you like? What new features do you like to see in the future updates? Please report bugs or make feature requests, or just leave us comments. 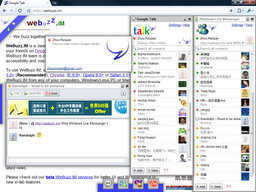 It seems that someone use proxy like SneakyPass ( http://sneakypass.com ) to use WeBuzz.IM web Gtalk/MSN Messenger/Yahoo/AIM services. We guess that webuzz.im is blocked by your network or *.im domains is not accessible in your network. We test WeBuzz.IM on SneakyPass, and everything is fine. So if you do have difficulties in accessing webuzz.im, you may try . But we still recommend you to visit WeBuzz.IM services by alternative URLs, which may work for you without any anonymous proxy. By the way, if you have problems when using other proxies, please let us know. We would like to help you. Providing better instant messaging accessibility for our services is our goal. Some users said that using WeBuzz.IM may cause CPU 100% usage and freeze the whole browser. It happens casually but it do cause lots of inconveniences. We are really very sorry about the inconveniences causing by this bug. We spent lots of time trying to find the bug. When finding the bug, we were doing lots of improvement at the same time. Now we are very pleased to announce that CPU 100% usage bug is FIXED. And we are rolling out WeBuzz.IM update v20090506. We are always do our best to provide better web IM user experiences. Please give us feedback or report bugs to make WeBuzz.IM client much better. Tips: As services are more and more stable, you can leave your IM open for days. You can hiberate your computer without logging out, WeBuzz.IM client will reconnect for you automatically the next time when you restart your computer.